Our Farm - Kalispell Kinders & More! Nestled 200 feet above the beautiful Flathead Valley in Montana, lies a 4.5 acre homestead that we call our little piece of heaven on earth. What you'll find is a wide array of livestock suited to a small land holder, as well as extensive herb/medicinal herb beds, and a large garden. You'll note an unfinished house, surrounded by extensive herbal beds. Don't be surprised if you're greeted by the barks from the official Akita/Lab/Retriever mixed security system we lovingly call our Akita 200. The resident barn cat may greet you for a belly rub. If that wasn't enough, the Montana Homestead and Kinder breed goats chime in, calling their human mommy and daddy to come out to investigate or is it close to feeding time? Dinner is served girls. GIRLS! This is our world, a little peace and comfort from a world gone slightly crazy. Here we raise all of our own food; raise Montana Homestead and Kinder goats for milk & meat; raise chickens for eggs; and Rex rabbits for meat and hides. Where the dogs provide companionship and two house cats really rule, but also where we can forget the hectic days and surround ourselves with love. We have a 50 x 50 garden space with additional permanent beds for our strawberries, raspberries, elderberries, rhubarb, asparagus, grapes, other unusual fruit bearing varieties for food and medicinal properties. 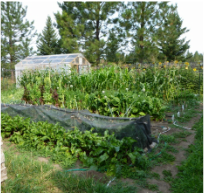 We practice crop rotation; companion planting; double row planting; as well as organic ways to improve the soil. We have been blessed with providing garden food for the area Soup Kitchen and continue to plant as much as possible for them as well. We can all our own food, freeze and can for the soup kitchen, dehydrate garden material for feeding the livestock in the winter, and all enjoy the fresh garden produce!! We have many herb, flower, and medicinal herb beds that we relax with. Our long term goal is to grow, sell, use, and teach others about the traditional use of herbs for health and well being. Supplying the hands on teaching that many are more comfortable with. letting us share our homestead with you. Then God said, "Behold, I have given you every plant yielding seed that is on the surface of all the earth, and every tree which has fruit yielding seed; it shall be food for you; and to every beast of the earth to every bird of the sky and to every thing that moves on the earth which has life, I have given every green plant for food", and it was so.